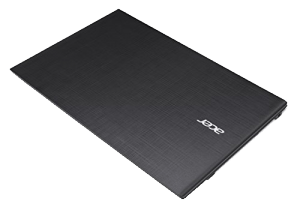 If you are looking for a high performing machine, but not interested in the huge price tags that accompany them, then you really need to be considering the Acer Aspire E 17 E5-772G-52Q7. Directly out of the box it has Windows 10 Home Edition, a gorgeous display with an awesome NVIDIA Graphics Processor to run it along with 8GB of RAM which streamlines your multitasking needs and desires and it’s all powered by a modern 5th generation dual core ultra-low voltage (ULV) Intel i5-5200U a dual core that’s been designed by the latest Broadwell microarchitecture. 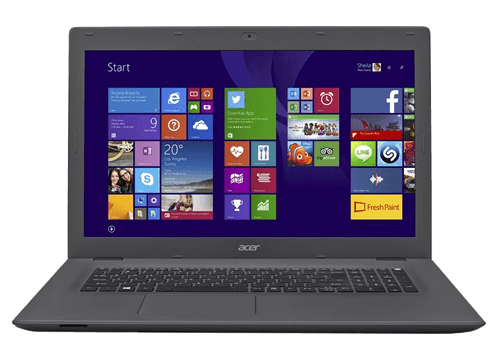 The Acer Aspire 17 E is a large laptop with a 17.3” Full HD Widescreen ComfyView color LED backlit display of 1920 x 1080 pixel resolution. This screen is perfect for streaming movies, editing your photo collages, gaming and also everyday internet and word processing work. The Acer is 5-15% faster than its Haswell 4200U predecessors due to the upgrade to the newer i5-5400U. The base speed is 2.2 GHz but if you bump up the Turbo Boost you can push it up to 2.7 GHz. It also boasts the first Intel chip that fully supports DirectX 11.2. Because of Hyperthreading the two cores can easily handle up to 4 threads in parallel, which greatly improves the laptop’s utilization. The NVIDIA Graphics GeForce 940M is perfect for supporting games and videos and there is 4GB of dedicated VRAM. 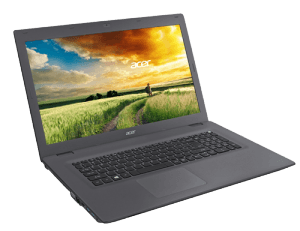 The Acer Aspire E 17 comes equipped with more than twice the size of most CPUs’ hard drives and it rocks a full TB of free space. That means you can have 320,000 of your photos; 250 full length DVD quality movies or 16,600 hours of your absolute favorite music playlists. 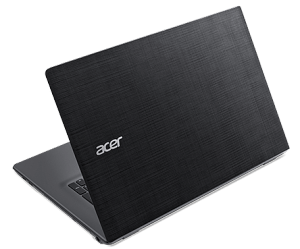 The Acer comes with 8GB DDR3L SDRAM which again is about 2 times the amount that you’re going to find on a modern CPU and it’s easily expandable up to 16GB of RAM. As for its connectivity it has four USB ports, two of them are USB 3.0 and the other two are USB 2.0, it also has a SD Card Reader, Gigabit ethernet and 802.11 a/c wireless for a fast connection to the internet. The only features that we consider to not be above the rest is the lack of an optical reader, which means no DVD or Blu-Ray player. 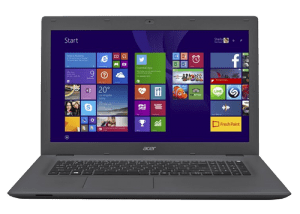 The weight is a bit heavy weighing in at 6.61 pounds and the battery life is quite short at about 4.5 hours of continual usage, but after all it’s powering an awful lot, so that should be expected from a heavy performing machine like this Acer.